Synopsis: Chris (McCartney), his girlfriend Natalie (Dudley) and her friend Amanda (Kelley) are traveling through Europe, including visiting Chris’ brother, Paul (Sadowski), in Kiev. Unbeknownst to the other three, Paul has changed their plans to visit Moscow into a day trip to the deserted Chernobyl nuclear plant. What starts off as an interesting trip turns into horror when the sun goes down. S: Hello readers! 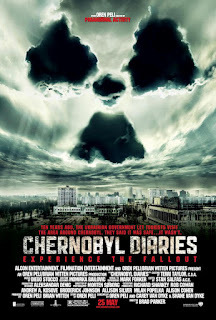 This past weekend Andrew saw Chernobyl Diaries (while I went to see The Best Exotic Marigold Hotel), and I interviewed him for his review of the new horror film. 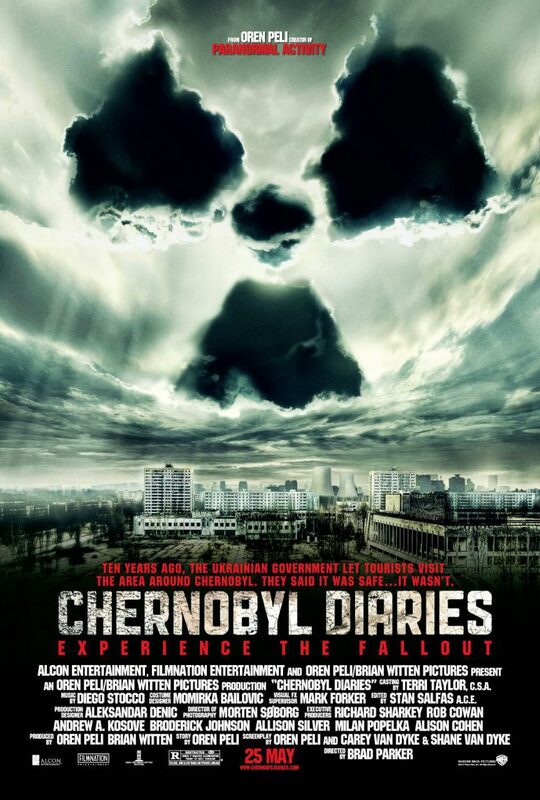 Andrew, Chernobyl Diaries is brought to us by the same guy that did Paranormal Activity, right? A: That’s correct. It’s produced by Oren Peli, who directed, produced and was the cinematographer for Paranormal Activity, and then he was producer of PA2 and PA3. S: So as a paranormal horror film, how did it stack up compared to PA? 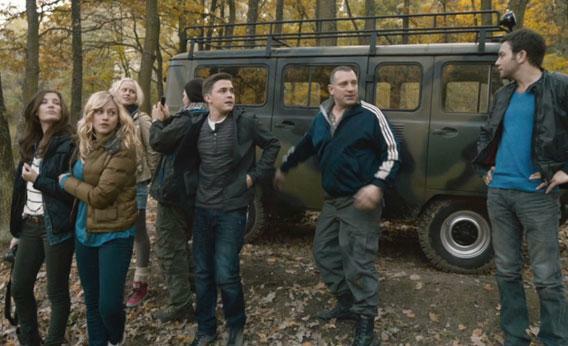 A: If I’m comparing it to the Paranormal Activity films, Chernobyl Diaries is not nearly as scary. The PA films are genuinely scary and have actually caused me to lose sleep because of my overactive imagination after seeing them. That wasn’t the case for CD. That said, what was a very big strength of PA and was probably the strength of CD is that they’re both incredibly atmospheric. I think they did a fantastic job getting the most out of the setting of the deserted town of Prypiat, the town adjacent to the Chernobyl nuclear plant where the workers’ families lived. The actual plant isn’t in much of the movie. So they use the town and the fact that nature’s kind of taken it back very well, especially the night scenes. S: I was gonna ask you how the setting took into it. As I said in our preview, I love the idea of this setting. 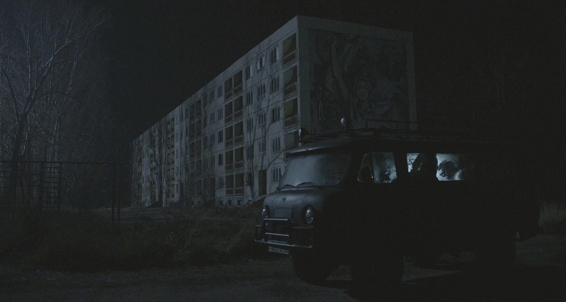 I think parts of Eastern Europe would be great places to set a scary movie. To me it seemed that parts of the trailer were predictable – was that the case in the film? A: Well like most genres there are familiar elements and formulaic parts, things that you can kind of see coming or maybe know what tropes certain things fit into. Obviously with a movie like this the characters are going to get picked off one by one, so that is not unlike a large percentage of horror movies in general. But I will say there were aspects that I was NOT expecting and did not see coming, and I liked the route that it took to get to those parts. S: Was this a point of view movie? A: It’s not, actually. The trailers and commercials make it seem like that, but what leads most to think it’s a POV film, I’d imagine, is actually just that the camera work is a handheld camera. So it’s a little shaky at times but I think it worked really well. It almost made you feel like you were there with the characters, it just wasn’t one of the characters holding the camera. So I feel like that added to the realism and atmosphere of it. S: How were the moments of tension? You mentioned that you won’t lose sleep over it but you also like horror movies because you like the adrenaline that it gives you. Did you get the same amount of adrenaline as a normal horror movie? A: There were plenty enough times were my pulse started to go a little faster, because there were some pretty tense moments. And again I attribute that to both the camera work, the actors – there was actually some pretty good acting – and again just the natural setting. While the characters did some predictable or even stupid things, I was thinking during the movie, you know what? If I was in this situation where they’re completely stranded and nobody knows that they’re there, someone gets injured so they can’t walk and you don’t want to leave them behind, I might do the same things. While you might go, “That’s really stupid, you should do that” I felt that some of the actors did a good job portraying what would actually happen. Especially if WE were personally stuck in this situation, especially if it was a sibling or a loved one in peril. So yes, there were some tense moments. And it’s because they’re going through these dark hallways and only have a flashlight. S: So it’s really atmospheric then. A: Yeah, there were a lot of shots of them in the van at night, and they have a light on, and you know how if you’re in a car and you have a light so you can’t really see outside? There are some good shots of that sort of thing. So I liked the way they shot the movie a lot and it helped that way. S: You mentioned that the acting was pretty good. I know we have Jesse McCartney, and I have a hard time believing he can act. S: Which always helps in scary movies. A: Exactly. Kelley I felt was the stronger of the two and she has a promising future I think. S: So what were your overall thoughts on Chernobyl Diaries? A: I was entertained by it in the sense that it was very atmospheric and very suspenseful. There’s an interesting mystery behind it, a GREAT setting obviously, but there was an interesting mystery as to what was actually going on. What was it that ruined their van? What’s really going on? And it’s not exactly what you would think it would be. So I liked that. I really liked the ending. That’s one thing about Oren Peli and the things he’s produced, like PA and Insidious, I’ve been a fan of the endings in all them. Because not all of them are necessarily happy endings, even if one or more of the characters survives. S: And it’s not necessary that they all have happy endings. A: Yeah, one of my favorite movies is and I wish we owned it is The Mist, which is based off a Stephen King story, and it has one of the BEST endings for any movie I’ve ever seen. And I’m glad they went the way they did. Not every ending needs to be on a happy note. S: So what would you tell our readers? A: If you liked the PA movies, I would suggest checking it out, but you don’t necessarily need to see it in theatres.